Over the last few months, I've intentionally doubled down on my investment in content marketing. For the past few years, my primary investment has been through nothing more than late nights and early mornings. Over the last few months, I changed that by investing heavily into the design of presentations using cold hard cash. The reason for this investment started during the early drafts of my first book - Stand Out: The Content Guide for Entrepreneurs.As I was writing this guide, I came to the conclusion that while I had some experience working with clients who wanted to leverage SlideShare, I never really tried it for myself. Thus, I decided it was time to put my money where my mouth was and see if SlideShare was actually worth it. My first SlideShare was the 11 Secret Ingredients to Viral Facebook Posts and as of writing this article, that deck has 17,823 views and has been shared everywhere from North America to Singapore. The process for building this deck was quite simple; I hired one of the best local designers I knew and gave her a skeleton of a deck with content. From there, she delivered and my eyes were opened to one of the most underrated marketing opportunities available today. Since then, I've created SlideShares that have generated more than 150,000 shares and have resulted in new business opportunities ranging from five figure consulting gigs to public speaking opportunities around North America. So what I have learned in all of this? Well, I've learned a lot. Here are a few of the biggest and most important lessons that I've learned during this process and that every content marketer should know about SlideShare. You can definitely get away with using some ugly graphics on SlideShare and succeeding but I've seen great decks fall flat solely because of their lack of quality design. I've made this mistake myself and have actually taken down old decks to replace them with redesigned ones. As a result, those ugly decks that once had 100-200 views are now sitting with a little over 5,000. The best approach I've found when hiring designers is through either a trusted recommendation or extensive research. I've hired designers through a many different avenues but these two options have always led me to the best final result. I know a lot of people who read Steve Job's autobiography and immediately think they need to be a criticizing, name calling visionary. Let's cut to the chase and accept the fact that none of us are Steve Jobs. So, let's also stop pretending we are and instead focus on delivering quality direction while letting the designer do their thing. A great designer will deliver with or without direction - a bad designer won't deliver even if you gave them a colouring book. Micromanaging a designer is a one way street to receiving a mediocre product and end result. First of all, respect the designers ability to deliver for you. If they don't deliver, then you can micro manage but you always give them a chance to deliver the first time without you creeping over their corner. You hire a designer because you respect their opinion and their work - if you think you know more than them, learn and do it yourself. I understand that design is very subjective which is why it's so important to be specific. If you're looking for a certain look, go out and find an example of the look you're looking for and share it with them. When I hire designers, I often look at their past work and share with them specific examples of things they've done in the past to give them an idea of what I'm looking for. If I took a shot of Jack Daniels every time I heard the phrase,"Content is King" I'd probably have liver disease. It's a phrase being thrown around more than a group of kids in bouncy castle. It's a phrase that has become so commonplace that it's actually becoming an idea that people truly believe in. It's incorrect. I've found this out time and time again with the content I've developed for myself and for clients. 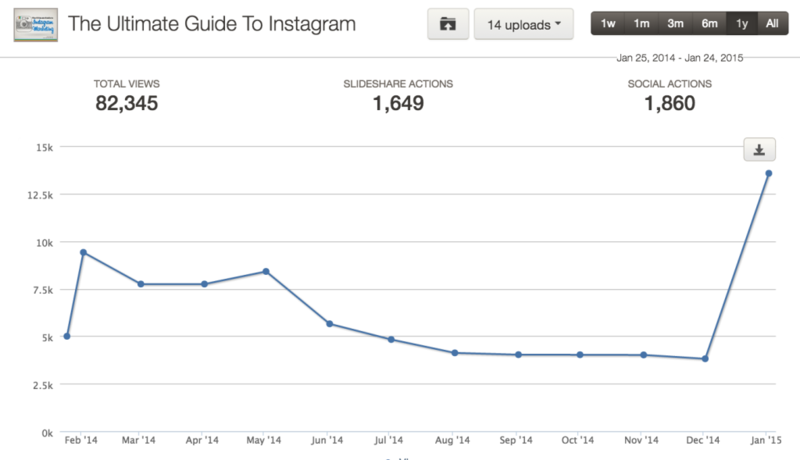 For example, let's look at the results from one of my most popular SlideShares, The Ultimate Guide to Instagram. I've intentionally left out the month of January because at that time, it went viral and took on a life of its own generating 80k views in one month. That was great but it was ongoing spikes that you see in February, May and most recently in January 2015 that I want to spend some time talking about. After publishing the deck and generating a solid amount of buzz, I decided that I was going to try and revive it by leveraging new distribution channels. In the New York Times Innovation report, it was found that media outlets that focus as much if not more time on distribution of their content were their biggest threat. For content marketers, we're all competing for eyeballs and not being willing to distribute your content whether it's a SlideShare or Infographic is a one way street to mediocrity. I decided in February I would write a few guest blog posts where the SlideShare would be embedded within the content. This resulted in the small spike you see in the graph above nearly doubling the views from 5k to a little under 10k. In May, the folks at 500 Startups shared the guide on their Twitter account which resulted in another boost in views. And most recently in January, the folks at Social Media Examiner shared the Guide driving another surge. So what does this mean? It means that without distribution channels for the content - It doesn't exist. If no one see's your blog post, if no one views your SlideShare, that content was created for the sake of creating. You need to distribute your content and build relationships with people who would be willing to share it on your behalf. Submit your content to niche communities. Email your content to a mailing list. Content is no longer king. Distribution is. 1. LinkedIn is a goldmine: It's no surprise that SlideShare and LinkedIn are in cahoots. SlideShare was acquired by LinkedIn for $119 million in cash and stock. As such, I've found that sharing SlideShare presentations on LinkedIn tend to drive (1) a significant amount of engagement and (2) a bit of extra love from the folks behind the LinkedIn and SlideShare social media accounts. 2. SlideShare of The Day: Another great benefit of LinkedIn is that they reward people who create great content on the regular. My content has been named SlideShare of the day on a regular basis and has been consistently shared by the @SlideShareToday account. How do I do it? I think the secret lies in being active, creating quality content and being a brand ambassador by sharing other great decks. 3. Cross Promotion Using Blog Posts: The most effective approach I've found in reigniting views in an older SlideShare is embedding them within other blog posts. Find a channel that has a significant following and embed the SlideShare to increase its reach. Content assets like presentations are meant to be repurposed and reused across a variety of different channels. 4. Leverage Email Newsletters: The day after I release a new SlideShare, I always send out an update to my 2000 or so subscribers. In doing this, I'm able to put relevant content in front of an audience that is both engaged and interested in the stories I tend to share. This drives an increase in both views and shares which ultimately allows for my content to be spread even further. I've seen a direct correlation between the amount of buzz my presentations generate and the amount of conversation happening on the news surrounding that topic. For example, when I rolled out the Ultimate Guide to Snapchat, it had a second spur of virality when media outlets started to break the news surrounding Snapchat having a privacy leak. I also generated another surge in traffic during the NFL playoffs on a deck I created about lessons we could take from Fantasy Football. At first I thought this might have just been a lucky chance but then I dug a bit deeper and noticed a trend. The SlideShares that tend to get featured on the homepage are very frequently Slideshares that are specific to that day and recent events. For example, in January, SlideShare was featuring a handful of slides that were focused around New Years Resolutions and predictions for the new year. And on Steve Jobs birthday, it was three SlideShare presentations that specifically talked about his presentation and leadership style. Understanding and leveraging trends that are happening now for your content is a great approach. It's also something that you can plan for in advance by looking at the calendar and seeing what's to come. So I know you might be wondering what the actual benefits were of creating $20,000 worth of presentations. Well, I'm happy to share that since starting this experiment with SlideShare I've seen pretty decent results. I can easily think of 2 paid speaking engagements that came from inbound leads on SlideShare and 2 consulting contracts. With that alone, I was able to make my money back and more. On top of that, I was able to generate an additional 1500 sign ups for my two books. I'm not going to suggest that SlideShare is right for everyone but I will suggest you keep an eye on it if you're in a B2B industry. It's a channel that is still growing and I believe has yet to reach its tipping point. As they begin to unveil new functionality such as video and slide creation; it's going to be an interesting year for Slideshare and I'm willing to bet that it's going to be a great one.